San José nursery school in Cajicá, Colombia, inherits the idea of an educational system based on the principle of flexibility and on the building’s relationship with the landscape. 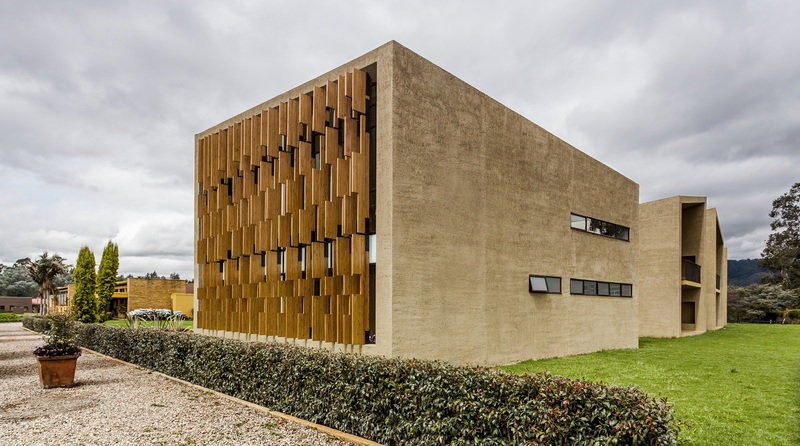 The San José project was designed by Daniel Bonilla Arquitectos and Marcela Albornoz of Taller de Arquitectura de Bogotá. Daniel Bonilla Arquitectos and Marcela Albornoz of Taller de Arquitectura de Bogotá designed the new San José nursery school in Cajicá, Colombia, in line with an educational tradition that views the school’s relationship with the outside world as an important key to learning. After working together for several years, Daniel Bonilla and Marcela Albornoz decided to found their own studio, a workshop focusing specifically on development of projects on an urban and architectural scale in Colombia’s capital city. 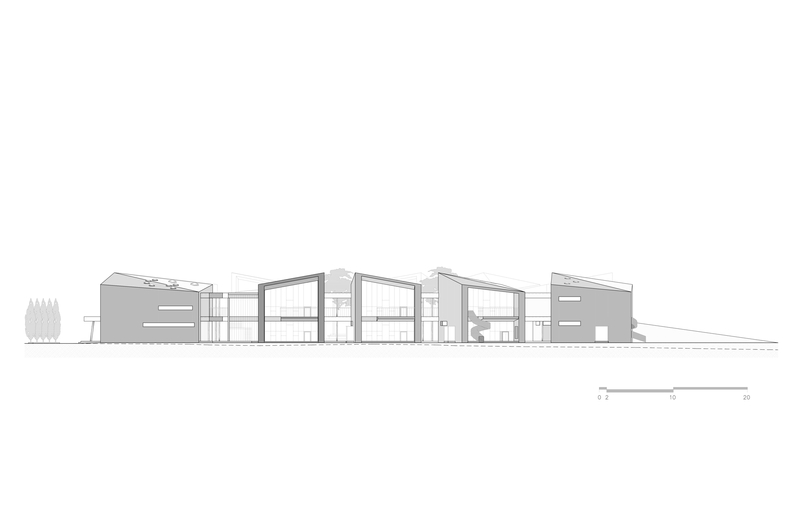 Their many cultural and educational projects in Bogotà include Los Nogales Arts Centre in 2009 and the Auditorium at Colegio Los Nogales in 2012; a few years later, in 2015, the architects completed their plans for a primary school complex commissioned by Colegio Anglo Colombiano, their first project implementing their concept of space made up of modules based on the concept of solids and hollows arranged around a vibrant core. The theme of the repeated cell revolving around a fulcrum is back in the design of San José nursery school in Cajicá, north of Bogotà. 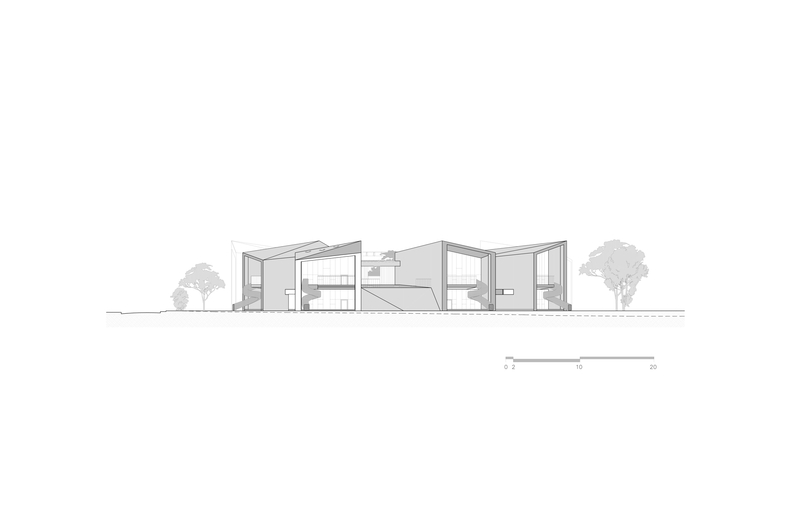 The building stands on the city limits, in a rural setting which the institution treats as an educational place, a pedagogical opportunity to encourage children to learn for themselves. Taller de Arquitectura de Bogotá’s project is inspired by the site itself, a complex measuring more than three thousand square metres on two levels, integrated into the greenery, in which the landscape is designed to become a part of school life. The project consists of a series of isolated volumes, a “village of knowledge”, as they call it at Taller de Arquitectura, with an organic character inspired by its natural surroundings, transformed into a space appropriate for preschool children. The units are connected by an outdoor circulation route forming a patio or "amorphous cloister" that designs and constructs the landscape the children see before them every day, shaping their first image of the world. In the architects’ concept, this type of configuration permits flexible development, forming what they call "finished partial units”: the cells may be multiplied over time to form new cores in response to the requirements of the teaching programme or the school’s attendance figures, in accordance with the available budget. 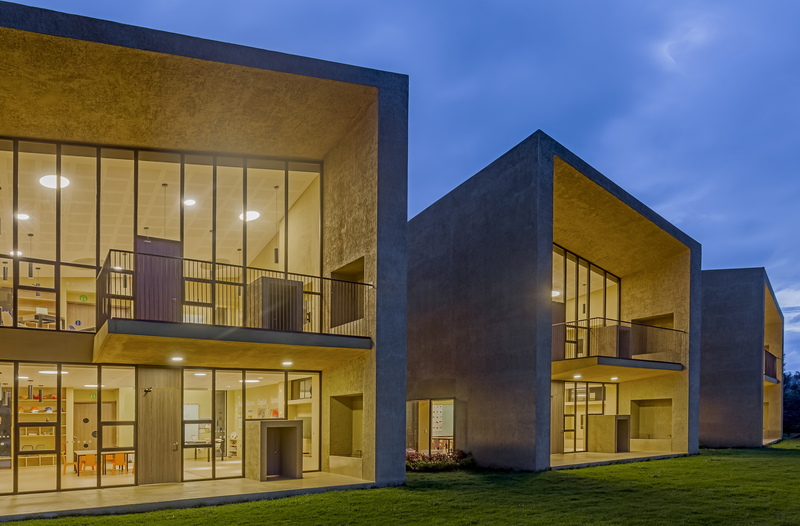 The orientation of the units in the school building, modules on two levels sharing the same concrete structure, is particularly interesting, as each of them is oriented differently to provide different views, making each pavilion unique. The overall result is a layout that is indefinite but not confused, susceptible to change but not disorderly and chaotic, as is often the case of overly schematic structures under the influence of natural human disorder. Use of concrete with a rustic, almost Brutalist finish, continuing in the indoor terraces, establishes continuity with the school’s existing administrative building. The rough, monochromatic texture transforms these big geometric blocks into monoliths, giving them an image of solidity, a symbolism offering a very specific, rigorous image of the school. On the other hand, the walls facing the inner courtyard and the world outside are made entirely of glass, allowing the little guests to fully enjoy the presence of nature, the succession of the seasons, changes in the weather, etc. The big jutting roofs ensure that the school receives plenty of indirect sunlight and the classrooms are sheltered from excessive heat. Each cell is developed on two levels with a very similar floor plan, including a main classroom with appurtenances, plus a paved patio overlooking the garden and a smaller patio on the first floor for playing outdoors in perfect safety. Despite the overall sobriety of the style and absence of decoration, a sort of manifesto of good education in the architects’ way of thinking, the classrooms often face onto one another and views cut across one another, maintaining good ventilation, bearing in mind that the quality of the educational environment requires well-ventilated, healthful spaces.